IFSC As Seen From City Quay (Dublin), originally uploaded by infomatique. 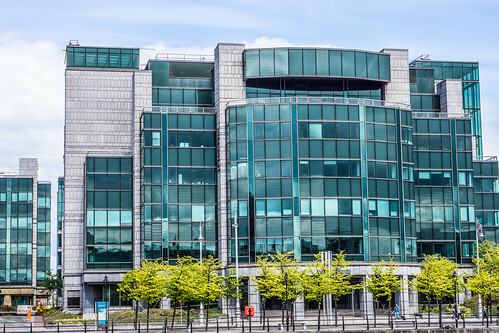 The International Financial Services Centre (IFSC) is a major financial services centre in North Wall, Dublin, Ireland. The centre employs 14,000 people and was the brainchild of an associate of businessman Dermot Desmond. Both the associate and Mr Desmond approached Charles Haughey, then in opposition, who made it the centrepiece of his economic manifesto when he came back into power. The Finance Act, 1987 (Section 30) allowed for the designation of such an area. The IFSC comprises the area between Memorial Road, Amiens Street, Lower Sheriff Street (including part of Crinan Strand), Guild Street, and the River Liffey along North Wall Quay and Custom House Quay. Adjacent districts include East Wall to the north and Spencer Dock to the east; the Custom House, Busáras and the city centre lie to the west. Within the IFSC, the original development area lies west of Commons Street. East of Commons Street is the later IFSC II area, along North Wall Quay and Lower Mayor Street. It is an integrated development located in the centre of the city which incorporates office accommodation, educational institutions, housing, restaurants and shopping facilities. It has expanded beyond its original site and has become a part of the wider Irish economy. The centre now houses financial institutions, together with a law firms and accountancy and taxation advisors who support them. At its heart is the National College of Ireland (where I am currently a mature student), which provides continuing education to the financial professionals who work there. This has boosted the availability of high value jobs building a wealth of financial services expertise among the Irish labour force. There are currently more than 430 financial operations allowed to trade within the IFSC. According to the official website it is home to more than half of the worlds top 50 financial institutions including Citibank, Commerzbank and Sumitomo.